Sigma Beauty Affiliate Program: Sigma Beauty Eye Shadow Launch! Sigma Beauty Eye Shadow Launch! We are back with another exciting product launch! 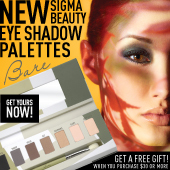 Introducing the new Sigma Beauty makeup line: the DARE, BARE and FLARE eye shadow palettes! You will now have every color you need to go from day to night, from neutral to bright, and from casual to formal in just a few minutes! Each eye shadow palette comes with a different dual-ended brush featuring Sigma Beauty’s all time best-selling brushes. In honor of the eye shadow palette release, we’ve created new affiliate banners! Just copy your favorite banner below, paste it on your blog, and add your affiliate link! The release of the eye shadow palettes can be used to boost your affiliate sales. Create excitement by sharing pictures and information about the palettes with your readers. Each palette contains 8 eye shadow colors and a carefully selected dual-ended brush. With the variety of colors, you can create countless makeup looks. And at only $35 a palette, it’s a great value! Utilize this product release to your advantage and market the new products to your clients! For more information about the DARE, BARE and FLARE palettes, click here! Eu gostaria de saber se os affiliados terao direito as paletas. Pra poder mostrar, testar como sao realmente pra saber o que falar pros clientes. If someone clicks on my affiliate link and then the banner on your front page and buys, I lose my sales and affiliate 68186 gets my sales because it directs everyone to sigmabeauty.com/category_s/92.htm?click=68186. Is that a mistake? Isn't it unfair that affiliates are losing all their sales when you set it up like this? We refer people to buy, but then we end up not making anything. Can you give more specific explanation how do i copy and paste the banner to my blog (on blogger)? @Dani Aquino The New Eye Palettes where sent out to the Sigma Affiliates that qualified in the Gold, Platinum, and Diamond groups of the Rewards Program for the month of May. @Nikkia (Silver Lips) To post a banner on your site first, click on the banner. Then, right click to "save picture as" to your computer. You are then able to link your affiliate number to the banner. Next, you should be able to load the banner to your page. Please contact affiliate@sigmabeauty.com with any additional trouble. @Edenable Please refer to the post for Nikkia (Silver Lips). @luciana Please try to clear your browsing history on your computer. I would then try to post the banner again. Omg its really awesome, I love these banners and i think these are the best ever banners by sigma . Hello, I am Make-Lovers.blogspot.com blog and have made ​​many sales with my code, I wonder how do I receive montly Beauty Sigma Certificates since I do not have paypal in the value of my commission to rescue Beauty products on the website of Sigma??? Banner placesd! And also a preview! Como eu posso ser qualificada como Sigma Affiliates Gold, Platinum ou Diamond? O que eu preciso fazer para fazer parte desses grupos? @Priscila Rodriques Payments are sent out in the beginning of every month. If you have earned commission for the month of June you will receive the payment in the beginning of July. For additional questions or to update your information, please email affiliate@sigmabeauty.com. @Mocinhas Elegantes To know how to qualify for the Rewards Program, please visit http://www.sigmabeautyaffiliates.blogspot.com/2011/01/welcome-to-sigma-beauty-affiliate.html. Muchísimas gracias al programa de afiliados por regalarme la F80, ES UNA MARAVILLA!! Estoy encantadísima con la brocha, y estoy deseando probar el resto de vuestros productos. Comenté a mis seguidoras de facebook y del blog, lo magnífico que es vuestro programa de afiliados y la mayoría se han apuntado también. Hello, how can I put this new banner on my blog? Where is the html of the banner for me to paste in my blog? @Ana Paula Castro There is no html version of the banner at this time. You can save the image to your computer, and upload it as a picture to your blog. Then add your affiliate link! Hello I posted a review on my new brushes sigma please do not stop reading it, I'd love to give me their opinion. Thank you very much! Please feel free to contact affiliate@sigmabeauty.com if you need help uploading your banner or inserting your affiliate link as the URL. Thanks!